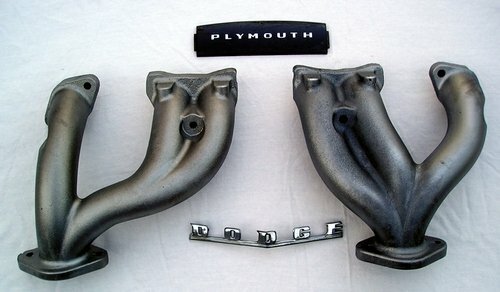 Removing intake + exhaust manifold from P15 in my '47 Plymouth. I have removed all nuts from the manifolds studs but manifolds are not coming off. I can wedge a chisel in most spots but not on the exhaust manifolds in the center. Any pointers would be appreciated! Thanks! Location: Stockton , ca . There is one nut on the underside in the middle that must be removed from underneath . 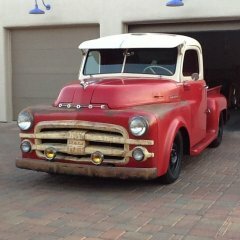 There have been photos posted of all of the fasteners , perhaps you can find the photos with a forum search . Yep, I found that tricky one in the middle underneath. That was the last one I found. I've been all over it with a flashlight and dont think I've missed any but I'll look for the pics. Thanks Jerry! The key number is thirteen . If you don't have 13 fasteners on the bench you shoud have before trying to pry or chisel. Some times a light slide hammer and chain can work if the engine is out of the car. The manifolds should come off as attached components, which can later be separated on the bench. I'm not sure about your application but on mine in addition to the studs there are 2 long bolts between the 2,3 and 4,5 exhaust ports lower side. I apologize for the delayed response. You guys are awesome! I only had 11 nuts removed.Thanks "greg g"! Still had difficulty finding the missing 2 until "The Oil Soup" posted. One of them didn't have a nut on the stud and the other one was easy to loosen but the nut is just spinning on the end of the stud. Guess the threads on that stud are corroded. However, the manifold still doesn't want to come off. I will wait until the light of day and give it another shot. I will update this post as soon as I make some more progress. Thanks again to all! Well gentlemen, I found the issue. The stud between #4 and #5 was the one that did not have a nut on it. However, it apparently corroded so bad that it basically rust welded (for lack of a better term) to the exhaust manifold. I had to use multiple chisels to inch the manifold away from the head evenly just millimeters at a time. (See pic below of the single stud hanging on to half of the manifold. The manifold was cracked in several places and was in bad shape before this. Of course, now it is in really bad shape. 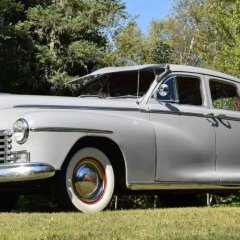 😢 Does anyone have a recommendation of where to find new exhaust and intake manifold for a P15 in a 1947 Plymouth Deluxe? I am assuming you did some damage on removal...however if you did not break the cast iron manifold itself, and the nicks aren't extreme, you could get the unit resurfaced at the machine shop....cost would be more cost effective doing this than buying one that may need be resurfaced also...if nicks are an issue....do inspect the very block itself to ensure this surface is also suitable for new gasket and effectively seal proper on installation. I see you're mas o menos commuting distance from Dallas. If memory serves me correctly, there are several salvage yards in/around Denton that specialize in older cars, and Dallas is practically surrounded by salvage yards as well, if you're willing to go the used parts route. A couple in Denton have been discussed in this Forum in the distant past. The 218ci as in your car served for many years, so there are a lot of them out there that still haven't been picked over. Worth a look-see, and if they let you look around it'd be a hoot to just spend some time at them (the ones with old cars, that is). 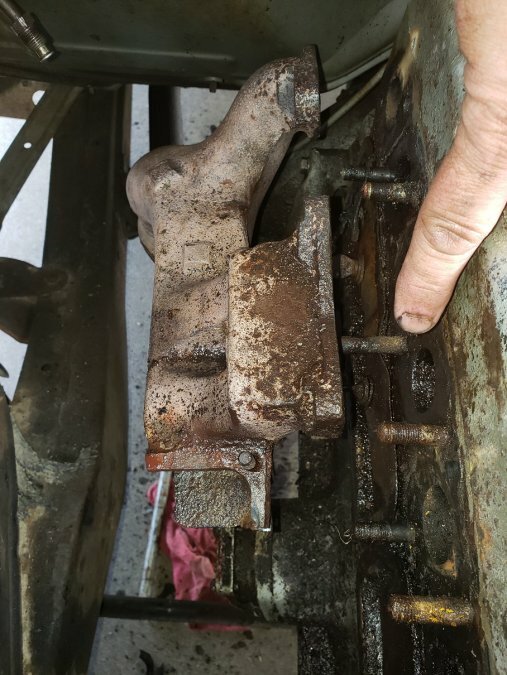 On your picture it does appear that the front section of the exhaust manifold is already off the motor-IE broken into two parts or more already?? While at some expense some say that they Can? be repaired if all pieces are available but reliability for the long run? Finding a replacement may take some time and expense but will be cheaper and longer lasting. It is Really good idea to have a machine shop surface the edges of the two- intake and exhaust manifold mounting surfaces . Just my opinion but have worked on a fair amount of old flattie sixes in the past. Pretty obvious, but replace all the studs , bolts, nuts and washers with correct parts (are easily avail) and put a good sealer on all the block side threads as many go into water jackets on the motor. If you want a little boost in power now would be the time to install a set of cast iron dual exhaust headers from Langdon's Stovebolt. Reg Evans, Checking them out now. thanks!! !